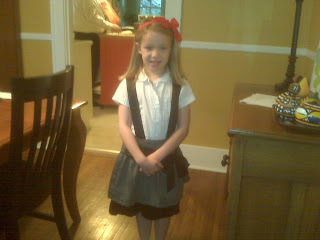 On March 20th, one of my sweet cousins, Mary Catherine, had a birthday! I missed putting it on my blog! Happy Late Birthday MC! I love you, Sweetie! Her sisters are Jennifer and Ann Marie. WELL Today is Ann Marie's birthday! 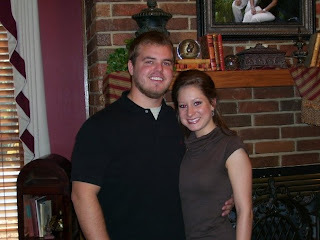 Here is a picture of Ann Marie and her fiancee, Lance. They are getting married on December 5th and are having a gorgeous Christmas wedding! We are all looking forward to that! Happy Birthday Ann Marie! I love you! Yes, there are many happy things going on today! Our sweet friends, Rhyanne and Chase are expecting a baby! 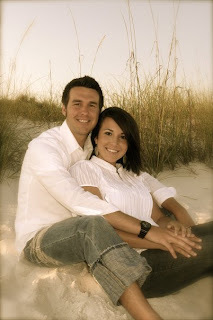 They are in our Sunday School class and are such a sweet couple. Congratulations, Rhyanne and Chase! How exciting! Today, I found this book. It is a devotional book but I had to get it. 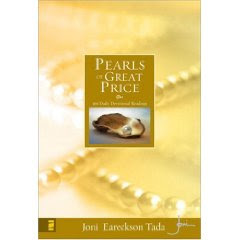 I love the Bible verse in Matthew when it talks about pearls, and also, our name...PRICE! I had to get this book! Well tomorrow is April Fool's Day. I remember when I was little, my Daddy would wake me up and say, Meredith! It's snowing outside, look!" Well, then I would look outside looking for snow. He would then say with a BIG Grin, "APRIL FOOLS!" HA! He always loved joking with us! This year, Career Conference was in Kansas City, KS. A severe snow storm warning was in effect.....YEP! It was, but nothing was happening before we left. We got there and the weather was just cold and cloudy! It took us a long time to find Cheesecake Factory. I had never been there so I was anxious to eat there! :) Anyway, we finally found it. It was just SOO YUMMY! Here we are before it started all ready to have a lot of fun! A contest is going on right now where you get to pick any of these limited edition red jackets (if you have a red jacket, you are moving up the career ladder :) ). I like the one in the middle. Well, I don't know...haven't made my mind up yet! Four National Sales Directors were there to speak. My favorite one there and now one of my top favorites was Gillian Ortega. All of them are just so very down to earth and just so sweet and personal with everyone! And Paige came too! She is also a consultant in NWA! We didn't see each other very much because there were so many people there. Okay, back on talking about weather, career conference wasn't supposed to be over until 4:30 yesterday. During lunch, the sleet came down like CRAZY! I did not want to risk riding back home late at night with the road so icy. Paige said she wanted to go ahead and leave and I said, "count me in, I am riding with you!" Anyway, the road was horrible! We did get home safe last night, but it was just a mess. I am glad all of the directors/consultants from NWA are safe now! Easter Decor, Quick Trip, and Snow? No! I love decorating. I especially love decorating a clean house! HA! I try to decorate during every holiday: Valentine's, then Easter, Thanksgiving, and of course, Christmas! 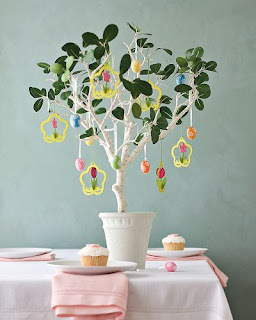 I just saw this Easter tree from Williams Sonoma and thought it was just too cute! And do ya'll love these? I remember my Nanny always gave me a Cadbury creme egg every Easter! I still love them to this day! Wow, this past weekend was a busy weekend. Thursday, Russell and I traveled to LA (Magnolia) to stay with Ricky and Jackie for a couple of nights. 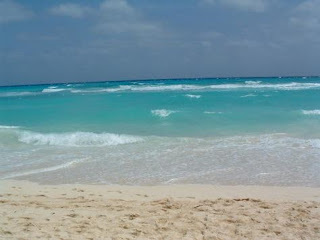 Mama was still in Mexico at that time! 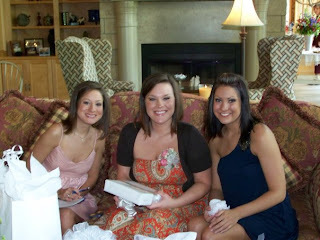 Friday was my friend, Jennifer's bridal luncheon. 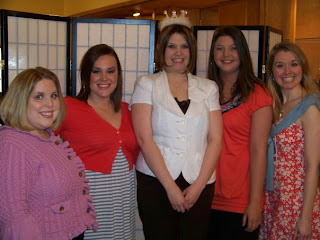 I am at the end on the left, then Jennifer Euler (my cousin), Jennifer-the BRIDE, Heather, and Christen. We had a good time visiting! And as you can see, Jennifer had a lot of fun in her bridal crown-ha! The wedding was so pretty. Chad and Jennifer are a sweet couple. Well I love this picture. When I was in high school, I had the best Sunday School teachers! Sandra Barrett and Janet Everett! Just about all the girls from the class were there! We HAD to get a picture taken! 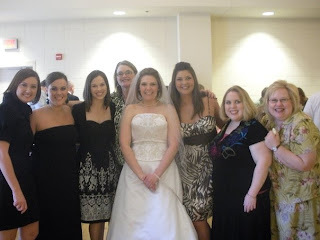 Here is Lauren, Jennifer, Whitney, Sandra, Jennifer, Heather, me and Janet at Jennifer Kirkley's wedding. While we were in Magnolia some, I had to visit with my VERY precious Aunt Nancy! Here we are at my engagement announcement coffee in 2007! She works at Jordan Brothers car dealership with two of my uncles in Magnolia. I always love visiting with her. I know she reads this so "HI AUNT NANCY! I LOVE YOU!" Lastly, I had to tell ya'll about another blog I started. Honestly, I was a little leery about starting this blog. But I see more pros than cons about starting it so I will tell you a little about it and ya'll can see for yourselves. 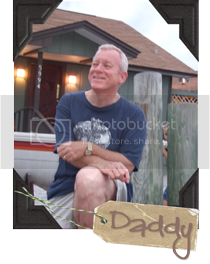 When my daddy was diagnosed w/ brain cancer in September, I didn't want to blog about it. I was and still am going through many emotional things right now. But at that time I couldn't bring myself to blog about it. However, I do believe there needs to be more awareness about all brain tumors and brain cancer. That is why I am doing this blog. Go to http://jjslegacy-meredith.blogspot.com. I don't know how much I will update it, but I will do my best. I will also say I would love more comments from you on this blog and the other-but especially on this new blog. My prayer is that it will help someone out in any way possible. So go to it, read, tell me your opinion! 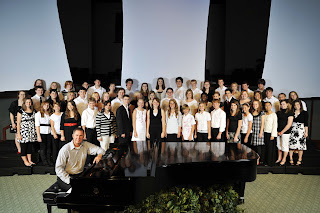 This wonderful group, 412 Praise, is going to Scotland tomorrow morning along with a few chapperones. They fly out tomorrow morning for the mission trip. Please keep them in your prayers! They are going to reach out to several people in Glasgow, Scotland. I love the youth group so much! They are just an awesome group of people! So, like I mentioned yesterday, Spring has SPRUNG! It has been in the 80's here today! So I thought I would post this yummy recipe from my Aunt Becky. So make it! It is yuuumy! HA! Shake all these ingredients til mixed well. Layer lettuce, then strawberries, cheese, and walnuts. Monday morning, my mom, aunt and cousin left for Mexico! They are probably on the beach right now having a marvelous time and staying in a gorgeous hotel! Makes me just a little jealous! HA! I have been thinking about how much I absolutely LOVE Springtime! It makes me so happy! 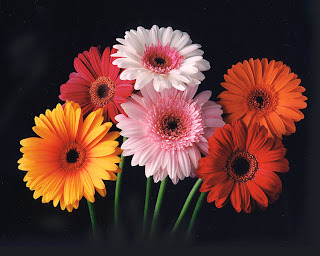 Gerber daisies are my favorite flower -even though pink roses are my favorite too! They are so happy and definitely remind me of Spring. I will have to go buy a few sometime soon just to make our house a little brighter! 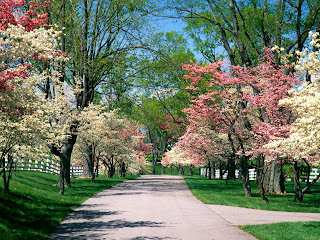 Oh and BEAUTIMOUS Dogwood trees just make my day! They are always pretty in the springtime. Ya just gotta love them. Dogwood trees make me think of Easter, one of my favorite times of the year also. 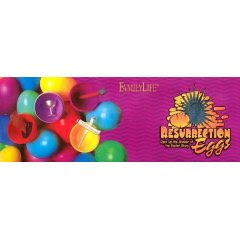 And Easter makes me think of Resurrection Eggs! I love these. I used to be a Sunday School teacher for 3 year olds and sometimes it was hard to keep their attention, but on Easter, I let them have one Easter basket and hid the resurrection eggs. I told each child their assigned color to find and sit at the table right when you find it because there is something special in each egg. Oh they loved it. It definitely got their attention by the time I got to the last egg, which is the best one of all! Soon, I am going to have to start using my MK Subtle tanning lotion! It gives you a sun kissed glow, is light, and smells like coconut! I know I have not blogged in a while but I will keep blogging regularly now! Yes, a lot of Mary Kay things have been happening lately. With our unit being new and a grand achiever team, so many new things are happening at once! Today, Christy let me know that our unit's Pontiac G6 came in today! We have been waiting for this since November, it was going to take about 15 weeks to get it in anyway! Here is Christy with her cake and balloons we got her! And here is Christy with her brand new car and her friends! And yes, she got to drive it off the showroom floor! Today was a beautiful Spring day! The weather was soo perfect! Well, we went to see Steel Magnolias! Pictured above are the characters Truvy and Annelle. Here are Shelby, Truvy, Ouiser, Annelle, M'Lynne, and Clairee before Shelby's wedding! I love so many lines in the movie and play. Two that I am partial to are: "My colors are blush and bashful, Mama!" and "Pink is my signature color!" We all loved the play and I have to admit, there were a couple of parts where I got a little teary! As my Daddy said when something like a broadway show or play was wonderful, "BRAVO, BRAVO!" Before the play, we went to Carrabba's together with Amy and Tony. It was good. I absolutely HAD to post this picture that my sister, Kelly sent me today! This is my little niece, Lauren dressed as Eloise from the book! She looks just like little Eloise, she absolutely does! HA! It was book fair day at Logan and Lauren's school and the kids were supposed to dress up as a book character! On a random note, have ya'll ever heard of Cary Collins Designs? She is a great designer and she makes cute calendars, gifts, and so much more! The website for that is www.carycollinsdesigns.com. Kelly gave me a calendar for Christmas and I love mine! Each month has a Bible verse on it! Well, I hope ya'll have a wonderful weekend! 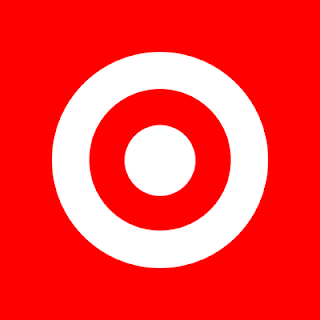 Yesterday, Russell and I went to Target because it opened in our area. It is sooo nice and we loved it! I will definitely go there a lot to shop! They even have a Pizza Hut Express and Starbucks in there also! Tomorrow night, we are meeting Amy and Tony and we are going to go see Steel Magnolias-the play. The Village Players of NWA are putting on this play and I absolutely can't wait to go see it! It is my very favorite movie. I have the special edition dvd and the Robert Harling, the writer of the play, is on the special feature part of it. The play is all about his sister, Susan. 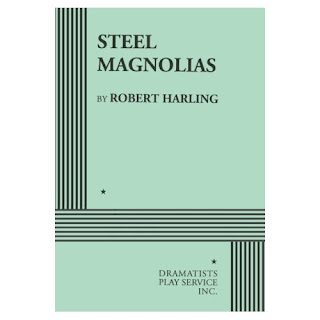 So the movie is based off of this play! YAY! I will tell ya'll about it tomorrow!